Family medicine physicians are one of the three specialties of primary care. They are often the first point of contact for many patients who feel sick or have medical questions. Some patients stick with their family doctor for 30 years! Family doctors have been called “the jack of all trades” because they are trained in delivering babies and taking care of babies, adolescents, teenagers, adults, and the elderly. 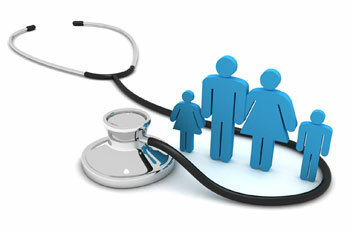 Family medicine is the comprehensive care for the full spectrum of different patients. If you plan to practice obstetrics, then you can add an extra 10 – 20 thousand dollars. Salary.com reports the national average to be $172,627. As you can see from their bell curve, the majority of jobs have been reported to gross $152,858 to $198,882. So those numbers are for the traditional family physician. There are a few other kinds of practices that family doctors can do and that will earn a significantly more amount of money. 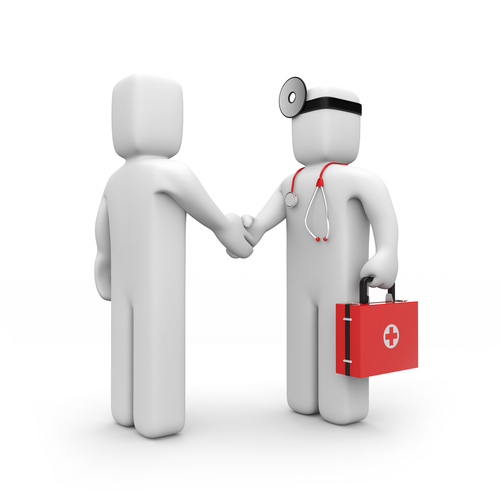 Have you heard of concierge medicine or direct-pay practices? Family physicians can earn $300,000 to $500,000 or more. I’ll talk about that in another post. Currently, there are 451 family medicine residency programs that offer a total of 2,730 spots. With the growing shortage of primary care physicians, we are seeing more spots in family medicine open annually. Just since last year there were 100 new spots! I’m a family medicine doctor myself about to graduate from residency. 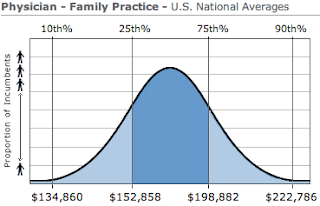 I found the national average for family physicians to be fairly accurate from a personal standpoint. I’ll be making $160,000 to start. Family medicine has been a rewarding experience for me and I’m looking forward to my career in it. If you like talking to people and dealing with a little bit of everything, family medicine is for you. I'm a physician and webpreneur. My main interest lies around how medicine can play a role with web 2.0. My works include Cool Health Infographics which curates the best health infographics circulating the web, Compare Caribbean Medical Schools which gives you objective information about each medical school in the caribbean, and MD Salaries which touches upon the financial aspects of a medical career. I'm also second in command at Scutwork.com, the first and largest database of residency reviews. I received my B.S. and M.D. at the Medical University of the Americas and completed a family medicine residency as Chief Resident and Teacher of the Year in Rapid City, SD. I am currently practicing medicine in upstate New York. Hi, will you be making 165000 after malpractice/tax etc?Is it the net salary? Are the figures that you report net salaries? that’s the gross salary i’ll be making which is the figure reported in most surveys. with my new job though, i’ll be working for a large hospital. so they will be covering the malpractice insurance. i’ll be covering the tax. if you’re considering a solo practice, subtract overhead from your yearly gross revenue. the typical overhead for a family medicine doctor is 30-40%. there’s a well-kept niche of family practitioners who use a different practice model called the Ideal Medical Practice model. they have managed to cut their overhead down to %10-20%. saves a lot of hemorrhaging money! hope that helps. thanks for commenting! Hi Doctor! I am a med student and I am seriously considering family medicine. I was just wondering how much one would make as a family medicine resident and do we have to start paying back loans in residency? Thanks! take a look at this table of average reporting FM resident salaries from 2008.
then take a look at my residency program, http://rcrhfmr.org . our salary is much higher than the averages in the table. so keep in mind that salaries can vary greatly depending on where you go and what kind of FM program you choose. Hey Doc, my friend’s brother is in 3rd year of FM and he’s been getting offers of 180,000-200,000 per year, with bonuses if he also covers ER duties. Have u heard of such offers? i have! whenever you add ER shifts to the equation, you can earn a ton more. i’ve noticed those kinds of offers in rural locations. is that the case for your friend’s brother? that sounds like a pretty good starting salary. but it doesn’t hurt to keep looking. thanks for chiming in! Hey doc, you’re right those offers were in rural settings, but that is where most of the demand is. it’s good stuff. glad to hear from you again. thanks for stopping by. Hey Doctor! I checked out the residency program from the link you posted in your reply to my earlier message. It looks like an awesome program. I was just wondering what is the average Step 1 scores that the program requires of their applicants. I’m writing my Step 1 in October so it would be interesting to know. Also, your posts are very informative and I was wondering if you also have twitter or a facebook page? Thanks! thanks for coming back to my site and giving me some feedback to improve on. so i just added the Wibiya Toolbar which should now be present at the bottom of the site. on it, you can access my twitter, the new facebook page, subscribe to RSS, share the page with other websites, or connect to your social networks straight from MD Salaries! What’s the average total cost of tuition? And what’s the average total debt after finishing residency? As far as average debt, it really depends on the above and how much you spend for living expenses while in school. Mine was less than 50k because my parents were able to help me out. I owe them a lot for supporting me. Thanks for your post. I hope we are not overloading you with questions. I would really like to do emergency medicine or family medicine. I am concerned that NPs and PAs are taking over the field and that doctors will be pushed out. Is this ridiculous thinking? What do you think? On a separate note, I talked to an ER doc who liked to travel and would work in one location for a couple months then try another location just to see the country. It seemed like it was pretty easy for him to move around to various jobs. I enjoy doing stuff out of the country and traveling. My concern is that family medicine may tie me down too much and that something like emergency medicine gives me more freedom to go and do what I want to do… ie… go work in Africa for a year. Is this reasonable thinking? Thanks for any advice you have! I’m a first year and just trying to figure it all out! no problem. im glad to answer any questions i can. i would say that NPs and PAs are going to be filling a very important need : access to primary care. i think FP and IM docs will not be drastically affected because the primary care shortage is so tremendous as well as the continued wishes of some patients who still prefer seeing a physician over a mid-level provider. so i’m not concerned that they will take over the field, but happy that they will be helping more patients. i think ER docs have more flexibility in their schedule than FM docs who practice in a traditional setting. by traditional setting, i mean working in a group practice or hospital employed practice with only 4 weeks off per year and 1 week of CME. if you opened your own practice or worked as a hospitalist or did locums or worked in an ER as a family medicine trained physician, then your schedule would be as flexible as your ER friend and having more freedom! with all that said, i think ER is a great field too with a lot of interesting clinical scenarios. it all boils down to what you want to do. keep in touch and good luck with your medical career!